I’ve been getting a lot of hits on my critical theory posts and the ones on Hirsch’s Validity in Interpretation. I thought I’d do some more on famous papers on related issues. Probably the most important and influential is Steven Knapp and Walter Benn Michaels’ Against Theory. It appeared in the Summer 1982 issue of Critical Inquiry. My initial goal was to provide a synopsis of this paper in a similar way I did to Hirsch’s book. Unfortunately, I’m either so confused by what they are trying to argue, or their argument is fundamentally flawed. So, I’m going argue against its main point. The entire second section of the paper is based around debunking Hirsch’s defense of intentionalism. If you’ll recall, Hirsch’s book is centered on the idea that the only valid interpretation of a work is the one the author intended. Then he spends the book constructing a theoretical framework for reconstructing the author’s intended meaning. For some reason, Knapp and Michaels think they will succeed in their argument against theory if they prove there is no such thing as intentionless meaning. By this, they mean a text cannot have meaning if there is no authorial intent. I think everyone on the authorial intent side of things (including Hirsch) is in agreement here. It is quite a bizarre thing to focus on. The crux of the paper ought to be an argument for why there is no need for theory if authorial intent is the only thing that matters. They just assert, without argument, the truth of this claim. But it’s the only claim in the paper that seems to need justification! I’ll try to lay out my case for why theory still matters. First, Knapp and Michaels seem to believe that theory is the attempt to relate authorial intent to meaning. I’m not sure where this comes from, but it takes a narrow view of theory that actually excludes Hirsch’s book. So, I’m not sure why they even talk about that book if this is their view (I know they separate the ontological and epistemological parts of theory; more on that later). Theory, as seen in practice, is almost always an attempt to relate authorial intent to interpretation. This creates no conflict with equating authorial intent and meaning. It doesn’t posit a need for intentionless meaning. It is a fact that language is inherently ambiguous. So, even though there is only one valid interpretation, a reader may not know what that is. This makes interpretation necessary. This means there must be tools for the reader to discover the meaning of the text. The grounding of these tools in a theoretical framework is what is usually meant by “theory.” Thus theory is needed. One way I could see arguing against theory is to claim that Hirsch provides all the theoretical framework we need, and so there is no point to continue the enterprise. I’d almost be able to get on board with that. Unfortunately, they seem to be arguing against Hirsch, and so they are creating a hole that needs to be filled with more theory! Suppose you have a math problem. It has one right answer. This doesn’t eliminate the usefulness of a theoretical framework for arriving at the correct answer. Once you have a way to get to the correct answer, more theory can be created to get to the correct answer more accurately or more quickly. Knapp and Michaels claim that theory is not needed if a text’s meaning only ever has the correct interpretation of the author’s intent. But the above example shows this not to be the case. A person can look at a math problem and not immediately see the answer, but after some derivation come to the correct answer. Similarly, a person can read a sentence and not immediately ascertain the author’s intention, but after some interpretation can come to the meaning. It is in that interpretation step that theory still has a function. I’m actually still extraordinarily confused at how Knapp and Michaels didn’t think of this or how they could read Hirsch’s book and think it was about an intention/meaning distinction rather than a book about how to interpret correctly. I’ll just reiterate how bizarre it is that they want to assume theory is only about an intention/meaning distinction and then engage Hirsch’s book which clearly is not about this at all. You can’t insist his book is theory and hold to the idea that theory is only about intention/meaning. For Hirsch and Juhl, the goal of theory is to provide an objectively valid method of literary interpretation. To make method possible, both are forced to imagine intentionless meanings or, in more general terms, to imagine a separation between language and speech acts. It may be the case that Hirsch and Juhl abstractly talk about this in their works (though I don’t recall because of how minor it is to their theory), but as I pointed out above, it isn’t a necessary component. You never have to imagine intentionless meanings for Hirsch. The only thing you have to imagine is that the reader doesn’t immediately know the author’s intention, which is almost a tautology of how reading works. If you don’t believe this, think of the math problem. We never had to imagine wrong answers to still have to do work to get to the right one. Sorry for harping on this point over and over, but it is exactly what the paper does. This makes no sense to me, because this “problem” (which I don’t see to be a problem at all; please make an argument!) is tangential to the question of theory at best and a non-issue at worst. How this paper became so important is beyond me when they seem to have offered a long-winded, purely semantic strawman. I have the book Against Theory: Literary Studies and the New Pragmatism on its way, so hopefully that will provide some more answers and clarification. I have not read either Hirsch or Knapp–Michaels, but I did read your blog posts about Hirsch. 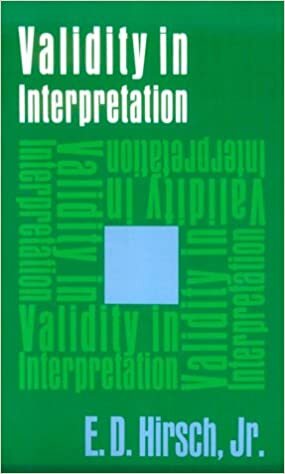 I just want to say I do have some sympathy for the idea that any theory seeking to validate interpretation presupposes the existence of intentionless meaning. It’s basically the Searle’s Chinese Room argument. Transported to this context, the idea could be that any theory like that of Hirsch (i.e. a theory demarcating correct interpretations from incorrect ones) justifies deductions about meaning purely on the basis of the outward form of the literary product under consideration. Now theoretically speaking, a monkey on a typewriter (or a Markov Chain-based AI system) could have produced the same content, but without the same intentionality as that of a human being (that is, the monkey will still be perceived to be a conditioned animal, and the AI system will still be considered as a cleverly-built machine that operates on the basis of physics and AI-principles). So then there would be meaning without intentionality. Of course this could be too simple, but it does fit in with the “against theory” mindset. Knapp-Michaels use a similar argument (you come across words written in the sand on the beach, but you don’t know whether they are accidental or intentional). I’m on board with this type of reasoning to show that it doesn’t make sense to talk about intentionless meaning, because the accidental “words” aren’t actually words but something our brains accidentally construe as such. What I’m confused about is where this fits in to Hirsch. To me, it seems his starting point is after these “ontological” discussions. He starts with: suppose we have a work which has an intentional meaning. How do we find it? Like the math problem example I give, I don’t think it is necessary to frame theory as: let’s demarcate the correct from incorrect (though I admit, this might be how Hirsch originally framed it). Why can’t we evade the problem by saying there is an intentional meaning there, and we don’t ever have to imagine “wrong answers” to work towards getting the right one?